As featured in the November 2012 issue of Model Aviation. October 27, 2012, would have been Carl’s 100th birthday. He accomplished more in his lifetime than any modeler or designer of his time could ever dream of, but his daughter believes that most remember him for who he was, rather than what he accomplished. “The thing that everybody always said to me was that he treated them so well,” Carol Lieberman, Carl’s daughter, said after shipping orders at Jet Glues—a spinoff company from one that her father started. “He had no sense that everybody wasn’t equal. He really liked people and that was the thing that I think impressed most people. And when it came to what Carl did for a living, his work was top-notch and original. 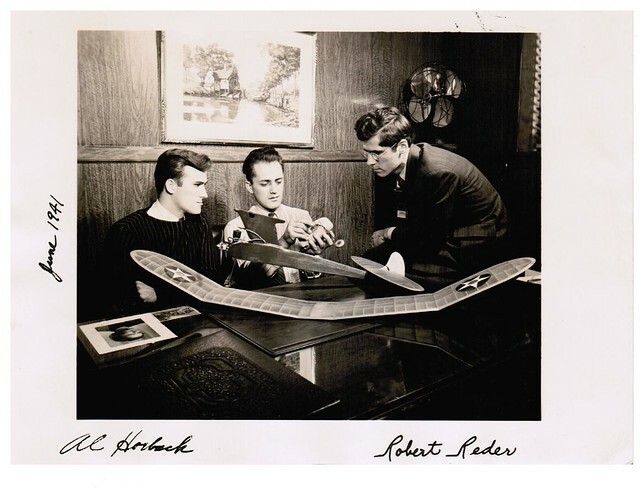 “He was probably one of the best [model airplane] designers in the country,” Jack said. Some of the models Carl designed include the Valkyrie, the Clipper, the Zipper, the Blazer, the Ranger, the Eagle, and the Sky Tiger. One of his models, the Gentle Lady, was created in honor of the love of his life, his wife, Beth, his daughter said. 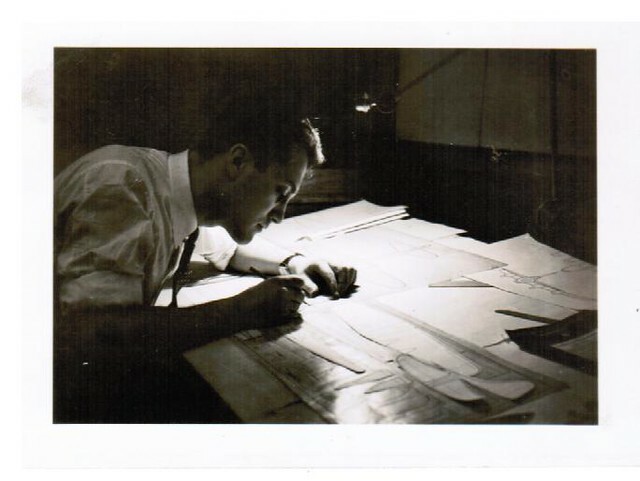 Carl’s passion for designing, building, and flying model airplanes apparently began when he was a child. “The designing started at a very, very early age,” Carol said. She has assignments from elementary and high school on which her father doodled airplane designs. “It was, without a doubt, a lifelong love for him,” she said. After graduating from high school, Carl enrolled at the University of Wisconsin. While there, he sold model airplane supplies through mail order. He had to withdraw because he had no money for tuition. Carol recalled a video interview conducted by AMA employees in the early 1980s where Carl admitted that he had no funds for college because he was spending most of his money on airplanes. 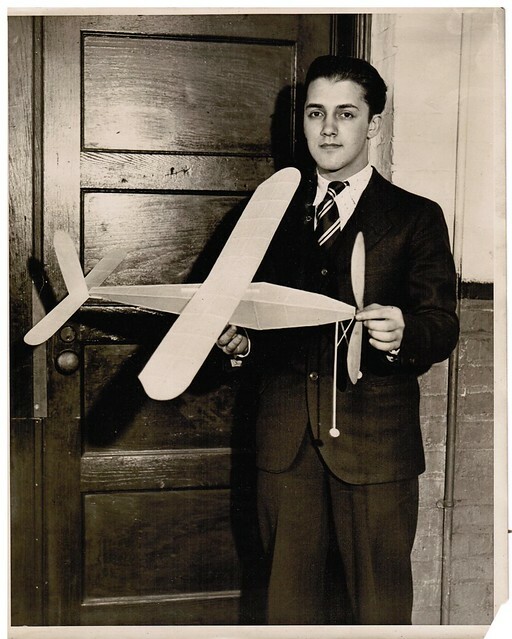 Carl opened a hobby shop in Chicago in 1935 and continued to build and fly airplanes. He created the Valkyrie, a gas-engine-powered model, in 1936. Some models he flew weren’t of his own design. Louis left the shop with some of Carl’s models, tested them, and sold them. From there, came the contract for Carl to work for Comet. Carol said she has the contract of employment her father signed. It was signed in April of 1940, with a beginning salary of $40 per week. It later increased to $45 per week, she said. “That was pretty hilarious, how he came to work there,” she said. While working as chief designer at Comet, Carl met Beth, a secretary who was Louis’s cousin. “Most people think of [model aircraft] as my dad’s industry. It was my mom’s industry as well as dad’s because of her family,” Carol said, adding that her mother was not a modeler at that time. “They met and fell in love and married,” Carol said of her parents. Carl worked for Comet for roughly five years before starting his own company with Mike Schlesinger and Sidney “Sid” Axelrod, with whom he had worked at Comet. American Hobby Specialties, later known as Top Flite Models, began operations in 1947 and sold gas model propellers called Top Flite and Power Prop. In 1955, Carl decided to venture out on his own and start his own company with his wife. Carl Goldberg Models, and what he created while operating the business, is likely what made him a household name. “It was just kind of a natural thing [for him to start the company] because of his design background,” Jack said of why he believed Carl started his own business. In the beginning, Carl Goldberg Models sold a simple line of $1 scalelike kits, mostly made of balsa. The company later expanded to include glue. Carol said her father was reluctant to charge more than necessary for his products because he felt they should be obtainable for everyone. She said this likely stemmed from the fact that Carl’s father left his mother when he was a 1-year-old, and she struggled to raise him on her own. “Like most small businesses, my brother and I occasionally did a few things,” Carol said of Carl Goldberg Models. She became more closely involved in the business shortly before her father passed away. “I had a role at the end. My mom was much more involved.” Carol helped do mailings in the summer. “I ran [the company] for about the last six years.” Her father passed away in 1985, and she sold the company to Lanier in 2002. Jack noted that Carl designed most of the airplanes that his company sold until the 1960s when an employee took over. Carl Goldberg Models is known for airplanes such as the Senior Falcon, Eaglet, Swordsman 18, Shoestring Stunter, and Junior Tiger. Jack said nearly everything Carl built flew perfectly. 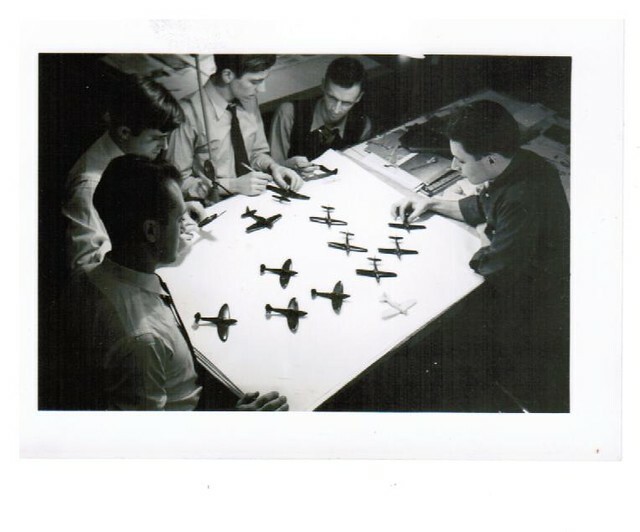 “Carl was very much a perfectionist.” Jack said the designer likely had some airplane designs that he didn’t like hidden in a closet somewhere, so no one would see them. Carol agreed. “He was never satisfied with himself. Carl was a perfectionist when it came to flying. He won first place in the 1934 and 1937 Indoor Nats. Carol remembers him staying up all night working on his models in the hangars at the naval bases where the Nats was held. “From as long as I can remember, we would all go to contests on the weekends,” Carol said. “Every summer our vacation was going to the Nats and we would take the ’52 Ford. Dad loved to drive. He was very particular about how the car was packed. That was quite a ritual and it was quite tense. And then when he got behind the wheel, you could literally see him unwind. Jack was a member of the Suburban Aero Club of Chicago and said Carl was one of the founding members. Carl also founded the Chicago Aeronuts club in the 1930s. Carol said the primary focus of the Aeronuts club was to share aeromodeling knowledge with others, in an effort to advance the sport. “He was a great believer in openness,” she said. This belief in being forthcoming was something Carol and her brother, Bob, honored after Carl’s death. Their father had open-heart surgery in 1981, during which he was given blood transfusions. At least one of the units of blood was contaminated with AIDS. He passed away on January 28, 1985. Before and after his death, Carl’s accomplishments did not go unnoticed. He was named an AMA Fellow in 1959, and was one of the first people inducted into the Model Aviation Hall of Fame. He was named to the National Free Flight Hall of Fame, the Vintage Radio Control Society Hall of Fame, and received the Howard McEntee Award in 1984. He was posthumously inducted into the Society of Antique Modelers Hall of Fame and the Kits and Plans Antiquitous Hall of Fame. Carl and Beth also ensured that others would receive the recognition that they deserved. They created the Carl and Beth Goldberg Vital People Award in 1983 to honor “vital people in the background of the modeling movement whose efforts to enhance the enjoyment of the hobby and whose accomplishments are seldom formally acknowledged.” Beth passed away in 1997. Carol doesn’t have any definite plans for honoring her father on the 100th anniversary of his birth, but she likely will reflect on the vivid memories she has of him when the day arrives. She said some may be surprised to learn that her father loved music. He had a beautiful singing voice and enjoyed composing music, she said. “From the time I was a small kid, I remember hearing him sing while shaving in the morning.” She said he also loved to write poetry. Share your photos using the form below or share comments in the comment section at the bottom. Carl Goldberg "The great designer"
I purchased the "Senior Falcon" way back in the day, and it was one of the best flying models ever. Thanks Carl for giving me a flawless RC plane to have fun with and show me how enjoyable it is to enter the hobby of model aviation. I remember meeting him (Carl Goldberg) at either the Toledo show or the Chicago Model show, at the Stephens Convention center. I was with my Dad, and I was about 14 or so. Carl shook my hand and smiled. I thought meeting him was like meeting a rock star. I am quite familiar with Mr Goldberg as a model airplane enthusiast and producer of designs and other related items. I grew up during WW2 when model airplanes were at there peak. We lived in So. Cal. and our home was across the street from a neighborhood hobby shop, Werts' to be exact in Oildale, [ Bakersfield ] Mr John Werts his sons John and Homer were big buddies and we all shared bigtime free-flight trips to contests and some national records. This being said I am so very glad to see the bio. 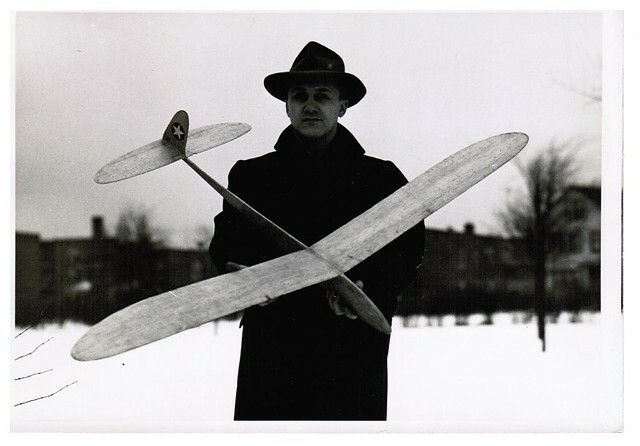 and comments from Carl's daugher extolling the virtues of this fine gentleman, although I have never met him I do have the greatest reverance for him as a gentleman and pioneer in the model plane industry and hobby. Ahhhh , the good ol days before electronic gadgetry !!! Great write up on Mr. Goldberg, maybe he will watch over me when I do the maden flight of my CZ Scimitar! I have always been a big fan of Carl's models starting with the 1/2A Blazer and Viking and the Falcon56. I have built several of each. I have also built his Shoestring Racer from the 60's and the legendary Valkyrie free-flight converted to electric RC. I'm currently finishing up the FAI version of the Viking which I hope to have in the air soon. Goldberg was an amazing designer and produced so many great designs. I and to build his Comet and Sailplane soon as well. Thanks for the great article. Really enjoyable! Hi Jim! I checked with our archivists at the National Model Aviation Museum. The only catalogs and flyers that we have about Carl Goldberg Models in that era are from 1968, 1969, and 1976. There was no mention of a Stuka kit in any of those catalogs and flyers that we have. One of my fondest memories is of my free flight Ranger. I had been flying C/L 049 powered Carl Goldberg profile models for some time when I decided to try FF. I had a little .020 motor and found a kit the Ranger 30. I spent many an hour building the plane and tweaking the glide till I thought it was perfect. Finally the day came to see if all the work had paid off. I filled the fuel tank (mistake) I started the motor and once satisfied with the tuning of the motor I turned the little plane loose. The little plane clawed it's way sky ward to about one hundred fifty feet the motor stopped and the plane broke into a perfect glide. It scribed a sixty foot circular glide path through the sky, never seeming to loose altitude. My Father and I watched it fly away. Unfortunatly I lost that plane on its maiden flight yet the memory of the flight still makes me happy. Thank You Mr, Carl Goldberg for the wonderful design and an everlasting memory. My first model was the Jr Skylane. rudder only and what a gerat flyer. Then it was a progression of Goldberg models: Falcon 56 which I flew until it fell apart with too much oil under the engine. Skylane 62 (one which I still have flying and its 30 years old! ), Ranger, Extra 300 (two of them) and countless control lines in the early days before I could afford a radio for the Jr Skylane. If it was a "Goldberg" I knew it would fly well. Thanks Carl, I knew you through your models. Began flying with a Falcon Jr. and numerous Goldberg Control Line Models, not to mention all the free flight! Just recvd a 30 year old Gentle Lady from an old friends estate. Still Flies great!! Thanks for the inspiration Carl! My 3rd R/C plane was the Goldberg Junior Falcon followed by the 1/2-A Cessna Skylane. Also built his rubber powered all balsa Stinson, a few others, Swordsman 18, Little Toot C/L planes. Still have a Falcon 56-III in the hangar. I enjoyed building his kits because there was reasonable quality assurance in each kit (not the usual die crunching or pine density balsa). Also, I enjoyed using the accessories (wheel retainers, control horns, spinners, and etc.). He had useful gadgets, one of them being the motor mount for the mountless Cox 290 C/L engines, which were left over when a ready-to-fly Cox plastic C/L plane met its end (usually in the first couple laps or less). This allowed the motor to be reinstalled in a balsa C/L plane. I was saddened to see the Goldberg company fade away. Thanks for sharing this interesting bit of history. Back in the 1970's, I saved up all of my pennies and purchased a Falcon 56 Mark II. I never had enough money to purchase a 4 channel radio but I dreamed of flying it one day. I even took it to college with me! LOL! Thanks for the memories! I purchased my first Gentle Lady RC airplane at age 9, in 1984. It was the the first RC airplane I built myself and undoubtedly the plane I taught myself to fly RC with. I always have incredibly fond memories of tossing that red glider off a hill repeatedly at my local schoolyard where I still regularly fly today. That plane and countless others like it including several more Gentle Ladies, Sophisticated Ladies and Electras are the foundation of my love of building and surely flying RC. I am now an accomplished furniture designer, fabricator and inventor and I can say that the meticulous detail, thought and inspired products that were Goldberg influenced my tastes and sensibilities profoundly. I never met Carl Goldberg but I always new he must of have been an amazing person. And I wish I would have or still could thank him for the effort he put into the hobby. So thanks Carl wherever you are. You make beautiful things. My first FLYING model was the famous Falcon junior, babe bee.049, and a self made 2 chanels radio .. What a lot of fun , for years . That happened in the 70s, I' m now 67 .. I found this site looking for information on a boxed kit I received that clearly has some age on it. It is labeled with NEW FAI VIKING, so I would assume this is from the first release of the kit. While I appreciate model planes I am not a modeler so will likely never do anything with this kit. If anyone here is interested in purchasing the kit contact me at david.dickerson.it@gmail.com with the subject FAI VIKING KIT. Glad to see this post as I was wondering about some of the details of the maker and the age of the kit. Early 60's flying my Carl Goldberg "Buster" with my Johnson Stunt engine. Every weekend at the Jr. High field with my friends. We even attached ribbons and had dog fights with them. I should build another one. Wow what a great read. The fond memories of many Goldberg Models. I have had 3 Gentle Lady's and one still flies the first one was builtin 1987 and I taught myself to fly/crash with. That plane was crashed and rebuilt so many times and it seemed to always get better. The old guys at the local hobby shop swore by the GL. the last few months i have found several old Goldberg models around and can't seem to pass them up. It is kind of sad to seem most of the old models disappearing, I guess not that many people want to spend the time to build and learn how satisfying it is to complete a kit. Carl Goldberg is one of my hero's a true pioneer . Built my first CG kit in the 80's- a Falcon 56. It was a real builder's & flyer's kit; not overbuilt and lots of attention given to aerodynamics - like the airfoiled stab. It flew beautifully all summer long at a Cape Cod field near where I worked at the time. Didn't even break a prop all that summer! I eventually sold it to a beginner to learn on. Somewhere, I also picked up a CG Skylark Jr kit & later found it in my stuff after a move back west. It was built from the start as an electric with two 400 size counter-rotating motors- a perfect combination! It flew great with just A-E-M, but I recently added rudder and it is now even smoother flying. Carl really was a genius designer of elegant airplanes! I have a very old plane called the Nifty Fifty by Carl Golberg. It is very old kit and I wish I knew what year it was made. I manufactured a couple of R/C kits in the mid 1970's. I bought Goldberg hardware items for my kits in bulk from the Carl Goldberg Company. I was surprised when Carl himself answered my letter of inquiry and even more surprised for him to come by my both at the Trade Show in Anaheim CA. He asked if I was satisfied with his hardware products. He complimented me on my kits and wished me continued success. I'd always been told he was very much the Gentleman and a nice man. My brief encounter was proof to me that he was. My meager efforts in the industry and what little money I spent with his company had to be just a drop in the bucket. I was pleased and impressed that he would take the time to inquire in person if I liked his hardware. When I was 12 or 13 I built Carl Goldberg's 1/2A blazer mounted with an OK cub .049. We had a field at the end of the street, but it wasn't big enough for FF. I got excited though, filled it with a 1/2 tank of gas, started it and let go, it flew beautiful and went out of sight. Never got it back, but the experience is a great memory for me. My father and I continued to build Goldberg models years afterwards, I was fortunate to work in a hobby shop while I was teenager, and sold many Goldberg kits. The first free flight trophy I won was in 1949, flying a Class A Ranger powered by a Bantam 19 spark ignition engine. At the 1950 Nats, I took a picture of Carl but was too shy to talk to him. In 1978, at the Nats, I met both Carl and his wife. He shook my hand, opened the trunk of his car and showed me his latest 1/2A model and discussed his current thinking about its design. I was very impressed with his friendliness and enthusiasm for modeling. `wonderful story sir. I am looking for a glider a1/a2? that has a pronounced underbelly just aft of the wing. any help out there? top mount wing....I think it was a Goldberg plan first flew it in 1990. I have fond memories of building and flying Carl Goldberg models. I first soloed on the eagle 2 and still have it enjoy flying it. I have since built and flown the anniversary cub, the extra 300 and the ultimate 10-300 bipe. All have been great kits that built easily and flew very well. I am saddened that most of these kits are no longer available. So many Modelers I’ve talked to speak highly of these kits and wish they were still available. Great planes still sells the eagle 2, cub and tiger kits, but as far a I know the other remaining gems are no longer manufactured. Thanks Carl Goldberg for all the great modeling memories. I had the pleasure of meeting Mr Goldberg twice at the 2 Natipnal championships in Mass. He actually remembered me at the second one even though we only met one time. His wife told me that he had a photographic memory. I had the pleasure of retrieving his FF model for him. He died the next year. are they still available if so where ?